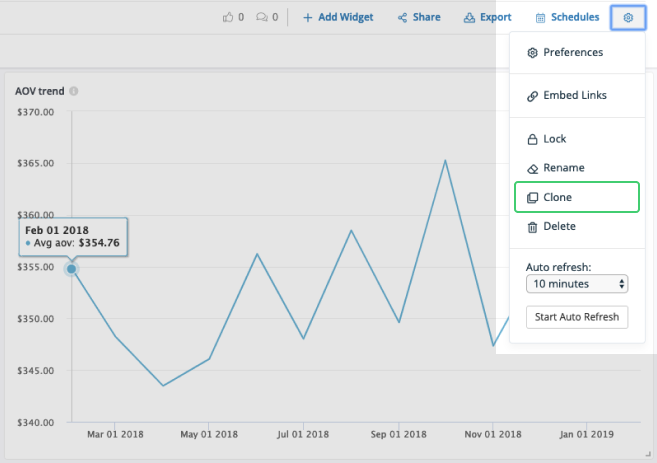 Cloning a dashboard allows you to copy all reports in a dashboard into a new dashboard. This is particularly useful if you want to re-create an existing set of charts but change the perspective (e.g. different data view, different market...). After duplicating the dashboard, you can edit each of the new reports to change its metric, data view, filter, or conditions. Simply access it via the Dashboard Settings > Clone. Check our docs for more information.